Horseradish (horse radish) is the common name for a perennial herb, Armoracia rusticana (syn. Cochlearia armoracia, Armoracia lapathifolia)) of the mustard or cabbage family (Brassicaceae), characterized by an upright stem, large, long-stalked, oblong lower leaves, smaller stalk-less or short-stalked upper leaves, small white, pinkish, or pinkish purple flowers in clusters, and a large, white, tapered root. The name also is applied to just the root of this plant, which is used to make a pungent condiment that is popular for culinary purposes and also has a history of medicinal use. Horseradish is mainly cultivated for its large white, tapered root; the edible leaves can be used in salads but rarely are eaten. As a root vegetable, which is grated for use and often mixed with vinegar, the sharp taste of horseradish offers a unique culinary experience and is used in many dishes, such as sauces, soups, and with meats and fish. Horseradish also provides a function for the ecosystem, being consumed by herbivores and also providing a nectar and pollen source for pollinating bees, flies, and beetles. Horseradish (Armoracia rusticana) belongs to the flowering plant family Brassicaceae (or Cruciferae), also known as the mustard family or the cabbage family. In addition to horseradish, mustard, and cabbage, the family includes such important commercial plants as broccoli, cauliflower, brussels sprouts, rutabaga, turnip, wasabi, radish, among others. Brassicaceae consists only of herbaceous plants with annual, biennial, or perennial lifespans. The leaves are alternate (rarely opposite), sometimes organized in basal rosettes. The structure of the flowers is extremely uniform throughout the family, having four free saccate sepals and four clawed free petals, staggered. They have six stamens, four of which are longer (as long as the petals, so relatively short in fact) and are arranged in a cross like the petals and the other two are shorter (tetradynamous flower). The pistil is made up of two fused carpels and the style is very short, with two lobes. Brassicaceae fruit is a peculiar kind of capsule named siliqua. It opens by two valves, which are the modified carpels, leaving the seeds attached to a framework made up of the placenta and tissue from the junction between the valves (replum). Armoracia rusticana, which is commonly also found listed as A. lapathifolia or Armoracia armoracia, grows to about 1.5 meters (five feet) in height. The long-stalked lower leaves are about 10 to 30 centimeters (4-12 inches) long, oblong with the base-heart shaped, and toothed. The stalk-less or short-stalked upper leaves are smaller in size than the lower leaves and are alternate, lance-shaped, and toothed. The flowers are about 6 to 8 millimeters (0.2-0.3 inches) long, white, pinkish, or pinkish purple in color, and appear in branched clusters. As with all members of the Brassicaceae family, there are four petals and six stamens; the tip of the petals are rounded. The fruit is in the form of an egg-shaped, two-chambered pod up to 6 millimeters (0.3 inches) long on a short stalk, and slightly round in cross section (vplants 2006). The root of the plant is large, thick, whitish, and tapered. The horseradish root itself has hardly any aroma. When cut or grated, however, enzymes from the damaged plant cells break down sinigrin (a glucosinolate) to produce allyl isothiocyanate (mustard oil), which irritates the sinuses and eyes. Once grated, if not used immediately or mixed in vinegar, the root darkens and loses its pungency and becomes unpleasantly bitter when exposed to air and heat. The plant is probably native to southeastern Europe and western Asia, but is popular around the world today. Horseradish has been cultivated since antiquity. According to Greek mythology, the Delphic Oracle told Apollo that the horseradish was worth its weight in gold. Horseradish was known in Egypt in 1500 B.C.E. and has traditionally been used by Jews from eastern Europe in Passover Seders (Pleasant 2003), often representing maror (bitter herbs). Cato (234 B.C.E.–149 B.C.E.) discusses the plant in his treatises on agriculture, and a mural in Pompeii showing the plant has survived until today. Horseradish is probably the plant mentioned by Pliny the Elder in his Natural History under the name of Amoracia, and recommended by him for its medicinal qualities, and possibly the wild radish, or raphanos agrios of the Greeks. Both root and leaves were used as a medicine during the Middle Ages and the root was used as a condiment on meats in Germany, Scandinavia, and Britain. It was brought to North America during Colonial times (Pleasant 2003). William Turner mentions horseradish as Red Cole in his Herbal (1551-1568), but not as a condiment. In The Herball, or Generall Historie of Plante (1597), John Gerard describes it under the name of raphanus rusticanus, stating that it occurs wild in several parts of England. After referring to its medicinal uses, he says: "the Horse Radish stamped with a little vinegar put thereto, is commonly used among the Germans for sauce to eat fish with and such like meates as we do mustarde." Horseradish is perennial in hardiness zones 2 to 9 and can be grown as an annual in other zones, though not as successfully as in zones with both a long growing season and winter temperatures cold enough to ensure plant dormancy. After the first frost in the autumn kills the leaves, the root is dug and divided. The main root is harvested and one or more large offshoots of the main root are replanted to produce next year's crop. Horseradish left undisturbed in the garden spreads via underground shoots and can become invasive. Older roots left in the ground become woody, after which they are no longer useful for culinary purposes, although older plants can be dug and redivided to start new plants (Pleasant 2003; Bert 2007). The plant is self-fertile, with hermaphrodite flowers (both male and female organs) (PFAF 2000). Native to Eastern Europe, the plant now is planted in other parts of Europe as well as the United States (Herbst 2001). In the United States, major producing areas include southwestern Illinois, Wisconsin, and Northern California. Collinsville, Illinois, within the Mississippi River Basin, is said to produce 60 percent of the world's horseradish supply and hosts the "International Horseradish Festival" each year (Arnot 2003). Although the term horseradish refers to the plant or the root, cooks often use the term "horseradish" or "prepared horseradish" to refer to the grated root of the horseradish plant or the grated root mixed with vinegar or beet juice. The root is available fresh (to be grated by the cook), or purchased as bottled horseradish (which is available white—preserved in vinegar—and red&mdahs;in beet juice), or purchased as dried horseradish (to be reconstituted before using) (Herbst 2001). Prepared horseradish in vinegar is white to creamy-beige in color. It will keep for months refrigerated but eventually will start to darken, indicating it is losing flavor and should be replaced. 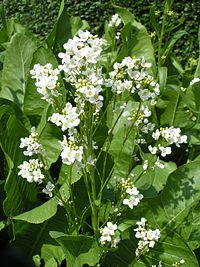 The leaves of the plant are referred to as "horseradish greens." While horseradish greens are edible and can be used in salads, they are not commonly eaten, with the plant mainly grown for the pungently spicy roots (Herbst 2001). Prepared horseradish is used as a condiment or ingredient in many dishes, such as a creamed sauce or with fish or meat. In the United States, prepared horseradish is commonly used as an ingredient in Bloody Mary cocktails, in cocktail sauce, as a sauce or spread on meat, chicken, and fish, and in sandwiches. The American fast-food restaurant chain Arby's uses horseradish in its "horsey sauce," which is provided as a regular condiment, alongside ketchup, mustard, and mayonnaise. This is not a common practice at its major competitors. There are several manufacturers of prepared horseradish in the United States. The largest is Gold's Horseradish in New York which sells about 2.5 million jars each year. Horseradish sauce made from grated horseradish root and cream is a popular condiment in the United Kingdom. It is often served with roast beef, but can be used in a number of other dishes also. Also popular in the UK is Tewkesbury mustard, a blend of mustard and grated horseradish originally created in medieval times and mentioned by Shakespeare. In the U.S., the term horseradish sauce refers to grated horseradish combined with mayonnaise or Miracle Whip salad dressing (such as Arby's "Horsey Sauce"). 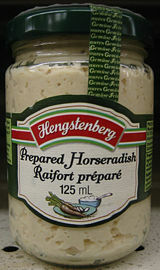 Kraft and other large condiment manufacturers sell this type of horseradish sauce. In Eastern European Jewish cuisine, a sweetened horseradish-vinegar sauce, called chrain in Yiddish (Glueck 2004), traditionally accompanies gefilte fish. There are two varieties of chrain. "Red" chrain is mixed with red beet (beetroot) and "white" chrain contains no beet. It is also popular in Poland (under the name of chrzan), in Russia (хрен), in Hungary (torma), in Romania (hrean), and in Bulgaria (хрян). Having this on the Easter table is a part of Easter tradition in Eastern and Central Europe. A variety with red beet also exists and it is called ćwikła z chrzanem or simply ćwikła in Poland. Horseradish (often grated and mixed with cream, hardboiled eggs, or apples) is also a traditional Easter dish in Slovenia and in the adjacent Italian region of Friuli Venezia Giulia. Horseradish is also used as a main ingredient for soups. In Polish Silesia region, horseradish soup is a main Easter Sunday dish (Urban-Klaehn 2008). Horseradish dyed green is often substituted for the more expensive wasabi traditionally served with sushi, even in Japan. (Downey 2000). The Japanese botanical name for horseradish is seiyōwasabi (セイヨウワサビ, 西洋山葵, seiyōwasabi), or "Western wasabi." Horseradish contains 2 glucosinolates (sinigrin and gluconasturtiin) which are responsible for its pungent taste (Richard). Horseradish contains potassium, calcium, magnesium, and phosphorus, as well as volatile oils, such as mustard oil (which has antibacterial properties due to the antibacterial mechanism of allyl isothiocyanate) (Lin et al. 2000). Fresh, the plant contains average 79.31 milligrams of vitamin C per 100 g of raw horseradish (Rinzler 1997). Horseradish has long use medicinally, both externally and internally. Early Greeks used horseradish as an aphrodisiac and for lower back pain (Arnot 2003). It has been used historically in Europe as a cough expectorant and treatment for scurvy, food poisoning, tuberculosis and colic (Arnot 2003). Known to have diuretic properties, the roots have been used to treat various minor health problems, including urinary tract infections, bronchitis, sinus congestion, ingrowing toenails, and coughs. Compounds found in horseradish have been found to kill some bacterial strains. The enzyme horseradish peroxidase, found in the plant, is used extensively in molecular biology for antibody detection, among other things. It is increasingly important in biochemical research fields (Purves and Lichtman 1985). Horseradish peroxidase (HRP) is commonly used for specifically coloring of thin (~5 micrometer) slices of tissue biopsies from patients suspected to have cancer. This is an area of human pathology called immunohistochemistry (IHC). Many molecules of HRP are bound to a polymer together with immunoglobulins that will bind to a primary immunoglobulin that recognizes a specific biomarker in cells in the tissue slices. The HRP will convert 3,3-diaminobenzidin (DAB) to a yellowish brown insoluble compound. This compound is visible in a microscope and helps the pathologist to diagnose the cancer. Arnot, S. 2003. Horseradish. Sauce Magazine January 30, 2003. Retrieved January 15, 2009. Bert. 2007. How To grow horseradish. Horseradishplants.com. Retrieved January 16, 2009. Downey, R. 2000. Wasabi: Green, and grate. Seattle Weekly March 22, 2000. Retrieved January 15, 2009. Glueck, M. A. 2004. The horseradish chronicles: The pain of chrain. Jewish World Review April 1, 2004. Retrieved January 16, 2009. Lin, C.-M., J. F. Preston, and C.-I. Wei. 2000. Antibacterial mechanism of allyl isothiocyanate. Journal of Food Protection 63(6): 727–734. Retrieved January 15, 2009. Plants for a Future (PFAF). 2000. Armoracia rusticana. Plants for a Future. Retrieved January 15, 2009. Pleasant, B. 2003. Horseradish. Mother Earth News October/November 2003. Retrieved January 15, 2009. Purves, D., and J. W. Lichtman. 1985. Cell marking with horseradish peroxidase. From D. Purves and J. W. Lichtman. Principles of Neural Development. Sunderland: Sinauer Associates. ISBN 0878937447. Richard, H. n.d. Arômes alimentaires. Arômes. Retrieved January 15, 2009. Rinzler, C. A. 1997. Book of Herbs and Spices. Ware, England: Wordsworth Editions. ISBN 1853263907. Urban-Klaehn, J. 2008. Horseradish soup recipe, updated with photographs: Polish Easter Food. Polish Culture Site article #83. Retrieved January 15, 2009.
vPlants Project. 2006. Armoracia rusticana P.G. Gaertn., B. Mey. & Scherb.. vPlants. Retrieved January 15, 2009. This page was last modified on 7 November 2011, at 15:19.